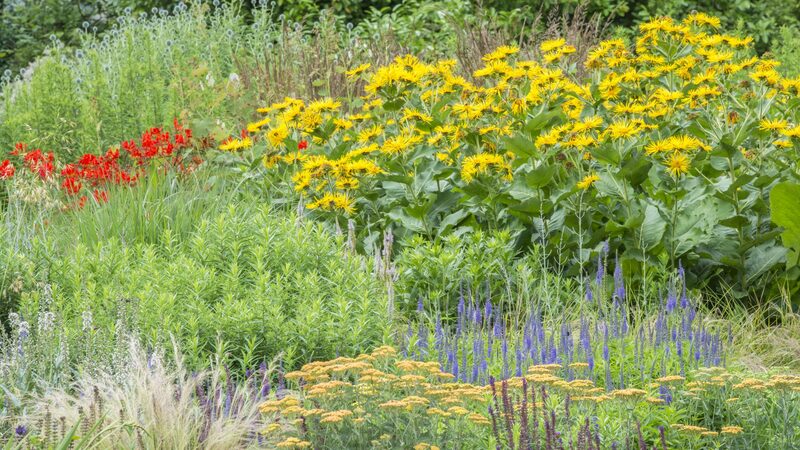 The herbaceous beds at the eastern end of the Fairway illustrate the wealth of perennial species available to the gardener. 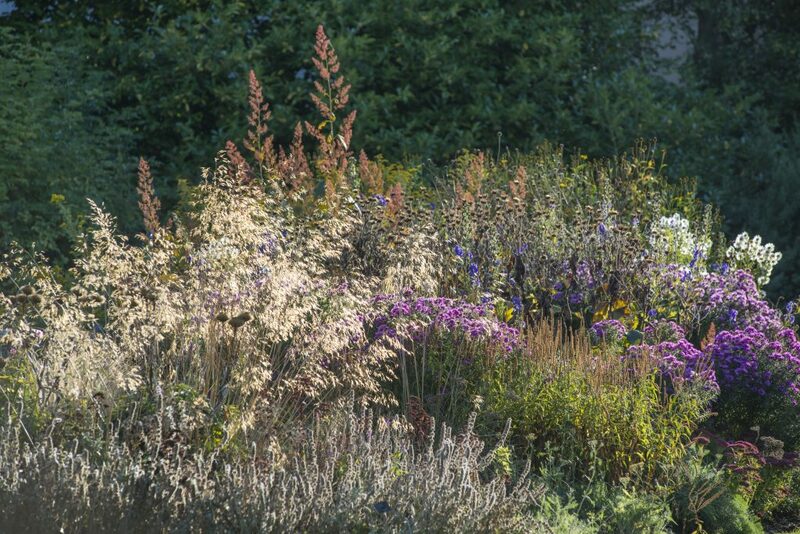 The beds are spectacular throughout the summer and into the autumn, with magnificent displays of bold, dramatic plants. Many of the plants featured here are familiar favourites, such as the lamb’s ears, Stachys byzantina. 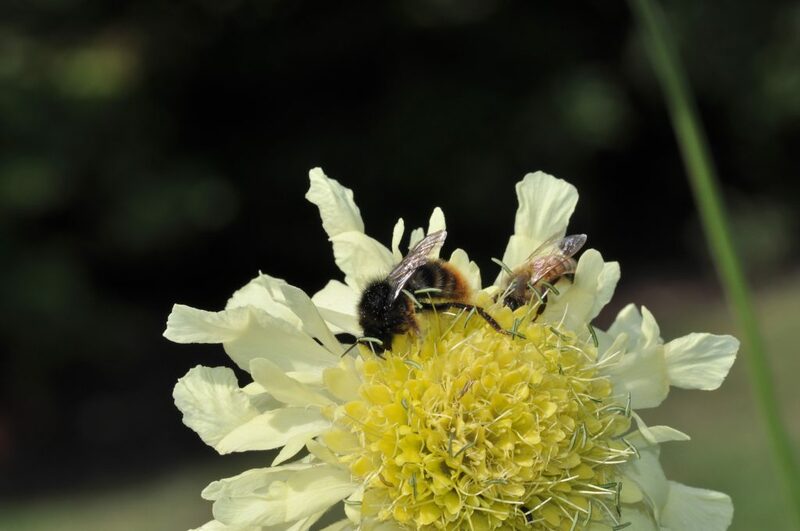 Other species like the giant scabious, Cephalaria gigantea, may be less widely grown, but are no less worthy of inclusion. The show begins in early summer with Geranium ‘Brookside’, Phlomis russeliana and Allium ‘Purple Sensation’. As we head towards midsummer the pace quickens and more flowers erupt to give a heady display. The bronzed ray florets of Helenium ‘Moerheim Beauty’ dance atop sturdy, branching stems. As summer progresses, these give way to a host of later flowering species. The cerise flowers of Aster novae-angliae ‘Alma Potschke’ persist until the first frosts of winter; the golden daisies of Rudbeckia laciniata bring cheer on gloomy autumnal days; and the branched, purple form of Sedum telephium ‘Matrona’ provide low-level, late summer form, and also serve as a magnet for bees. The purple spikes of Salvia nemorosa ‘Caradonna’ contrast with the wispy plumes of the Mexican feathergrass, Nassella tenuissima, and the flattened corymbs of the gently glowing Achillea ‘Feuerland’. 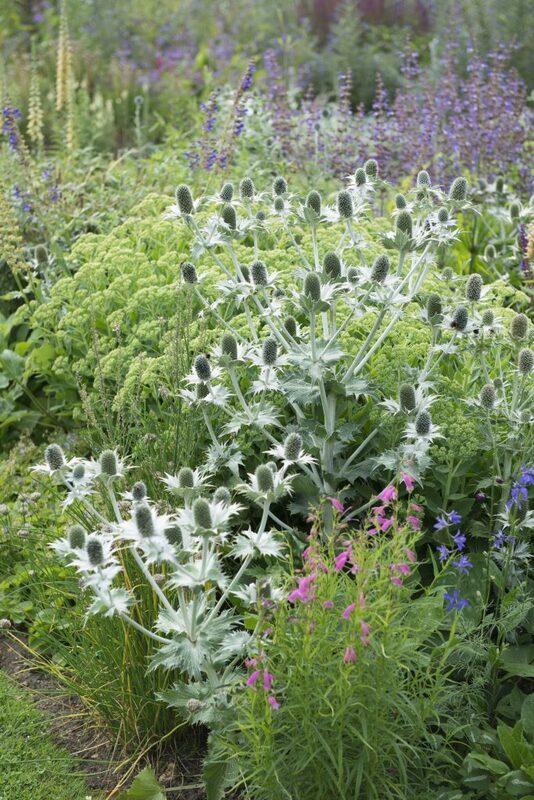 The silvered, branching stems of Miss Willmott’s ghost, Eryngium giganteum provide structural interest in contrast to the wine-coloured blooms of Knautia macedonica. Throughout, the floral bonanza is punctuated by an array of grasses. Giant oat, Stipa gigantea, sends up panicles of silvering spikelets, which flutter gracefully in a breeze; the erect stems of Calamagrostis x acutiflora ‘Karl Foerster’ stand sentinel amongst a throng of vivid blooms; while the low domes of Pennisetum orientale display gently arching, soft pink panicles. As summer gives way to autumn, all gracefully decline and fade to take on golden hues. While there may be no flower to take us into winter, the varied skeletal forms will continue to deliver structural interest.